AGOURA HILLS, Calif.  June 2, 2009  THQ Inc. (NASDAQ: THQI) and JAKKS Pacific, Inc. (NASDAQ: JAKK) today announced that WWE® SmackDown® vs. Raw® 2010 is in development for the Xbox 360® video game and entertainment system from Microsoft, PLAYSTATION®3 computer entertainment system, PlayStation®2 computer entertainment system, PSP® (PlayStation®Portable) system, Wii™ and Nintendo DS™. Joining the prominent World Wrestling Entertainment® roster of WWE SmackDown/SmackDown vs. Raw licensed videogames, which have shipped more than 47 million units worldwide since 1999, WWE SmackDown vs. Raw 2010 is scheduled for release in Fall 2009. WWE SmackDown vs. 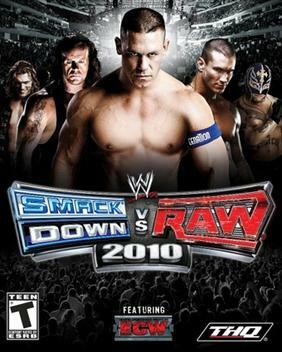 Raw 2010 will be supported through a look at SmackDown vs. Raw franchise history at E3 2009 in the THQ booth – number 5300 in the West Hall of the Los Angeles Convention Center. In addition, WWE Superstar Kofi Kingston™ and current WWE Divas Champion Maryse™ are scheduled to sign autographs on Tuesday, June 2 from 2:00 p.m. to 3:30 p.m., while WWE Superstar John Morrison™ is scheduled to sign autographs on Wednesday, June 3 from 2:00 p.m. to 3:30 p.m.
Additional information on World Wrestling Entertainment Inc. (NYSE: WWE), can be found at wwe.com and corporate.wwe.com. For information on our global activities, go to http://www.wwe.com/worldwide/.About THQ Inc.
THQ Inc. (NASDAQ: THQI) is a leading worldwide developer and publisher of interactive entertainment software. The company develops its products for all popular game systems, personal computers and wireless devices. Headquartered in Los Angeles County, California, THQ sells product through its global network of offices located throughout North America, Europe and Asia Pacific. More information about THQ and its products may be found at www.thq.com. THQ and the THQ logo are trademarks and/or registered trademarks of THQ Inc.About JAKKS Pacific, Inc.
JAKKS Pacific, Inc. (NASDAQ: JAKK) is a leading designer and marketer of toys and consumer products, with a wide range of products that feature some of the most popular children’s toy licenses in the world. JAKKS’ diverse portfolio includes Action Figures, Art Activity Kits, Stationery, Writing Instruments, Performance Kites, Water Toys, Sports Activity Toys, Vehicles, Infant/Pre-School, Plush, Construction Toys, Electronics, Dolls, Dress-Up, Role Play, and Pet Toys and Accessories, sold under various proprietary brands including JAKKS Pacific®, Play Along®, Flying Colors®, Creative Designs International™, Road Champs®, Child Guidance®, Pentech®, Funnoodle®, Go Fly a Kite®, Color Workshop®, JAKKS Pets™, EyeClops®, Plug It In & Play TV Games™, Kids Only®, Tollytots® and Disguise™. JAKKS is an award-winning licensee of several hundred nationally and internationally known trademarks including Disney, Nickelodeon, Warner Bros., World Wrestling Entertainment, Ultimate Fighting Championship, Graco® and Cabbage Patch Kids. JAKKS and THQ Inc. participate in a joint venture that has worldwide rights to publish and market World Wrestling Entertainment video games. For further information, visit www.jakks.com.Trademarks: All WWE programming, talent names, images, likenesses, slogans, wrestling moves, trademarks, copyrights and logos are the exclusive property of World Wrestling Entertainment, Inc. and its subsidiaries. All other trademarks, logos and copyrights are the property of their respective owners. “PlayStation”, “PLAYSTATION” and “PS” Family logo and “PSP” are registered trademarks of Sony Computer Entertainment Inc. PSP® system – Memory Stick Duo™ may be required (sold separately). This press release may contain forward–looking statements (within the meaning of the Private Securities Litigation Reform Act of 1995) that are based on current expectations, estimates and projections about JAKKS Pacific’s business based partly on assumptions made by its management. These statements are not guarantees of future performance and involve risks, uncertainties and assumptions that are difficult to predict. Therefore, actual outcomes and results may differ materially from what is expressed or forecasted in such statements due to numerous factors, including, but not limited to, those described above, changes in demand for JAKKS’ products, product mix, the timing of customer orders and deliveries, the impact of competitive products and pricing, and difficulties with integrating acquired businesses. The forward-looking statements contained herein speak only as of the date on which they are made, and JAKKS undertakes no obligation to update any of them to reflect events or circumstances after the date of this release.